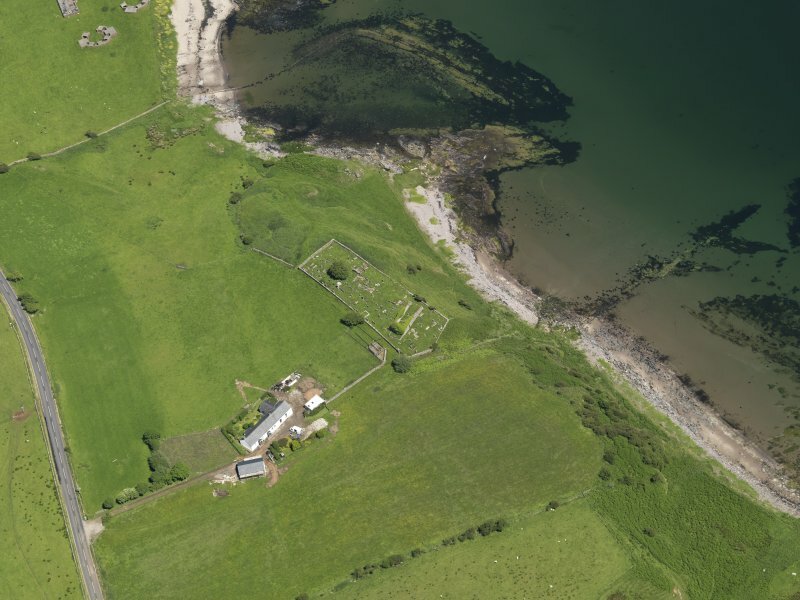 Oblique aerial view centred on the remains of the church with the farmstead adjacent, taken from the SW.
Oblique aerial view centred on the remains of the church with the farmstead adjacent, taken from the W.
Kilchousland Churchyard. 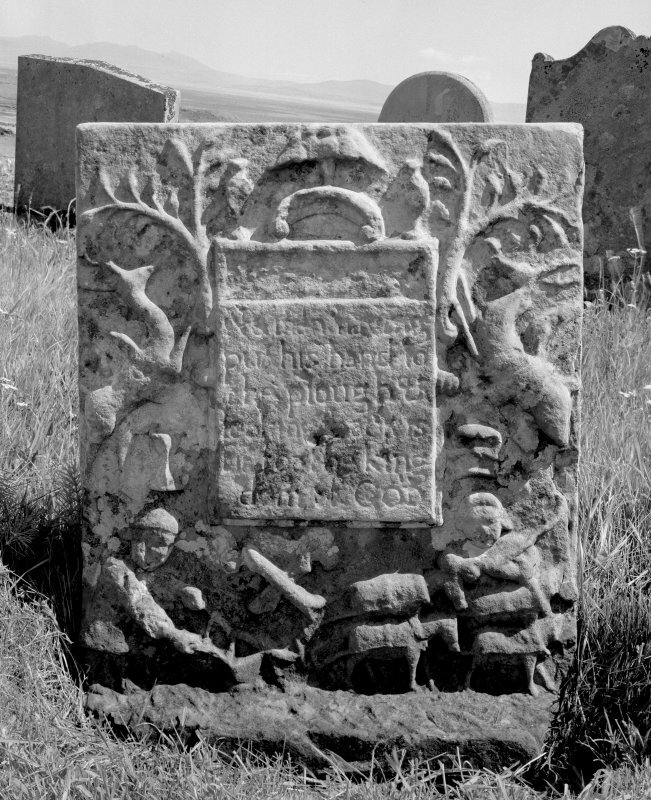 Headstone, Margrat Culbeson, 1716. Kilchousland Old Parish Church. General view from South-West. Kilchousland Church. Detail of built-up window in North wall. 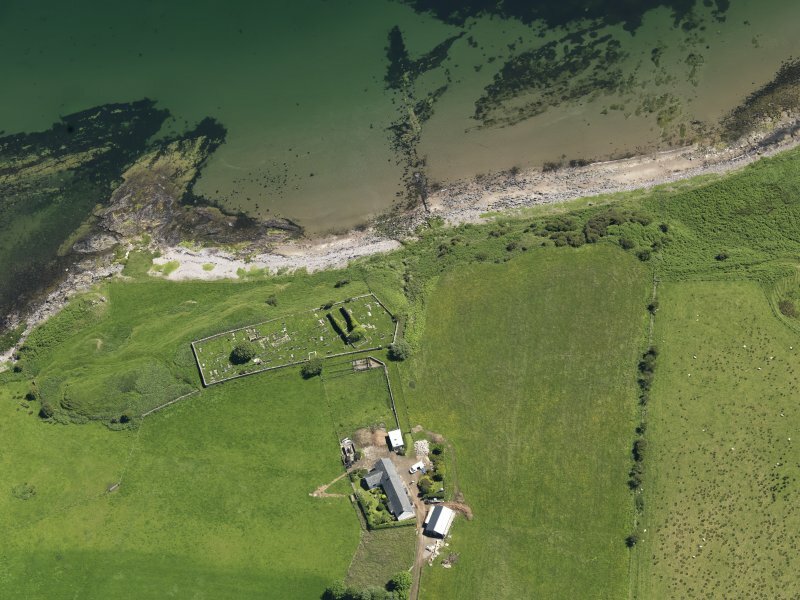 Oblique aerial view centred on the remains of the church with the farmstead adjacent, taken from the S.
Oblique aerial view centred on the remains of the church with the farmstead adjacent, taken from the E.
Kilchousland Old Parish Church, Baird Stone. General view. Kilchousland Church, Huie tombstone. General view of Huie tombstone. Insc: 'To Let Me Live, To Let Me Die, Y't I May Live, Eternallie'. 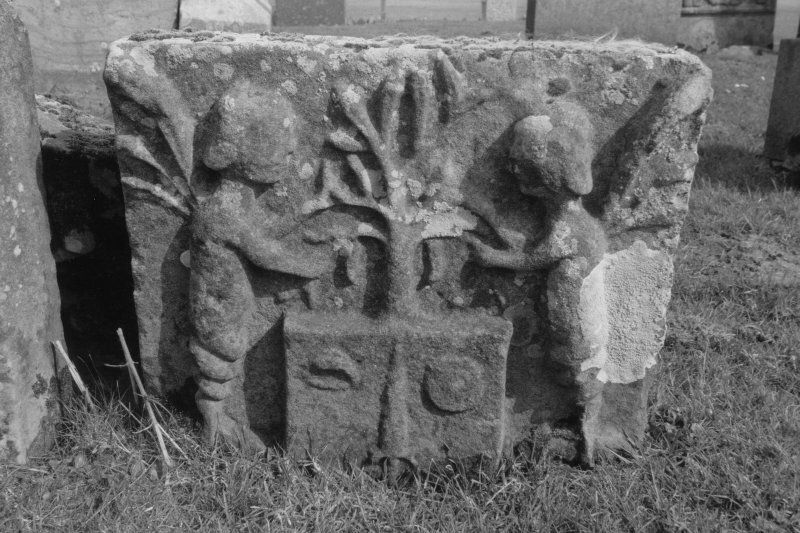 Kilchousland Old Parish Church, Campbell tombstone. General view of tombstone. Kilchousland Old Parish Church. View of windows in South wall. (NR 7515 2204) Church (NR) (In Ruins). The remains of the church of the former parish of Kilchousland. 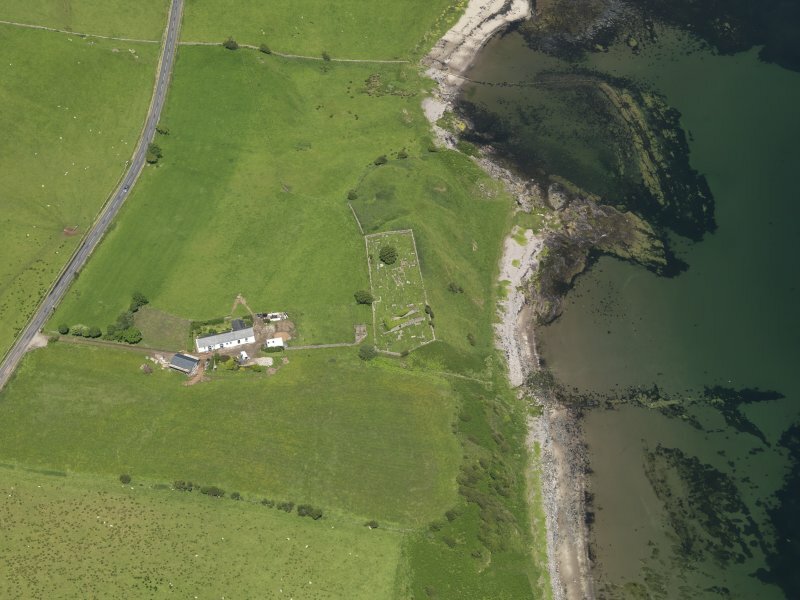 Little is known of its early history but the dedication appears to have been to St Constantine and the church may have been abandoned in 1617 when the parish was united with Kilkerran and Kilmichael. 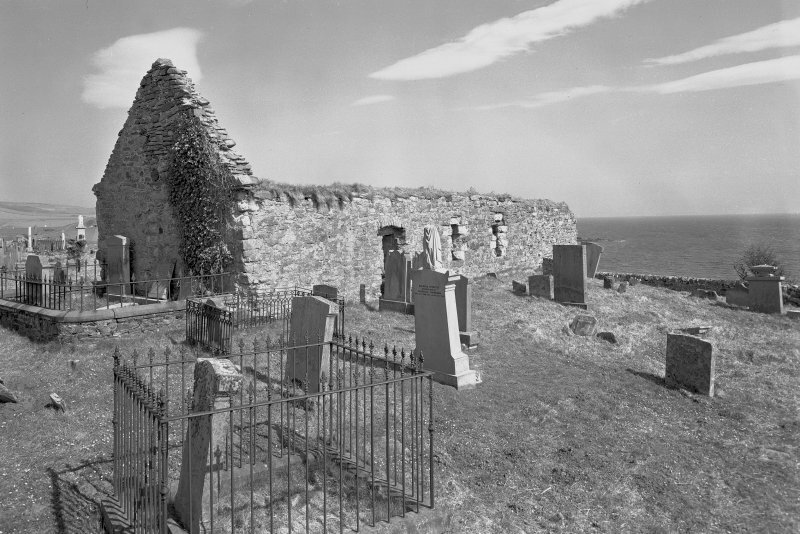 The church stands within its graveyard on the cliff-edge and although it is now roofless the north, south and west walls are almost intact. The east wall, which was standing in 1873 has now almost completely disappeared. 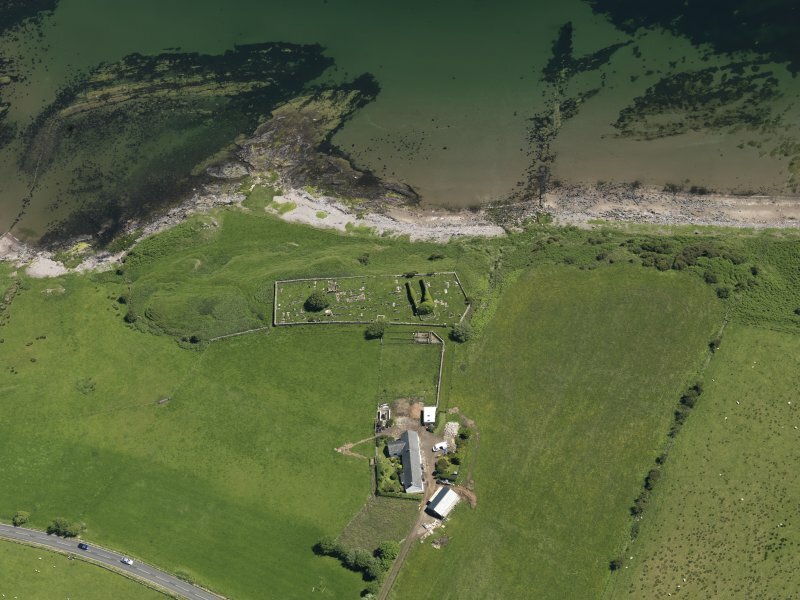 The building comprises work of two main periods, a small oblong church of perhaps the 12th century having been substantially reconstructed and extended eastward at a considerably later date, possibly during the 16th century. 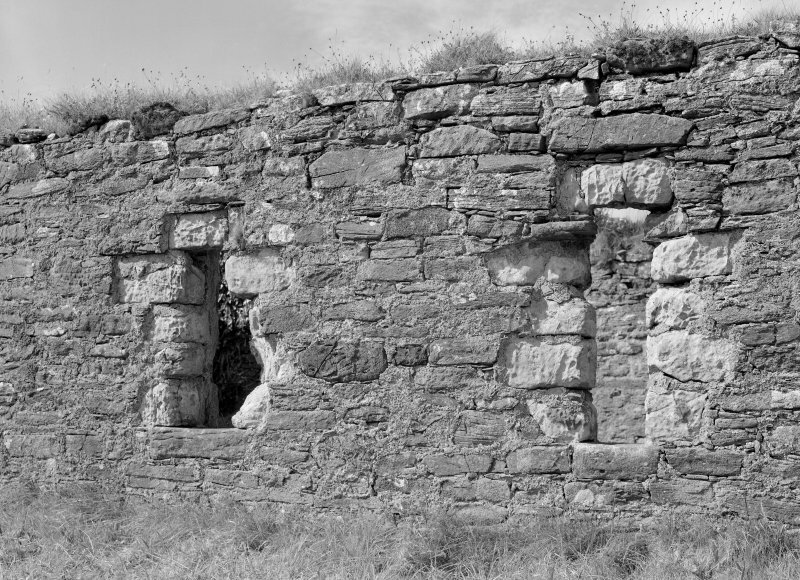 The oldest portion of the structure is the central section of the north wall, which is constructed of roughly coursed rubble masonry with dressings of red sand stone. 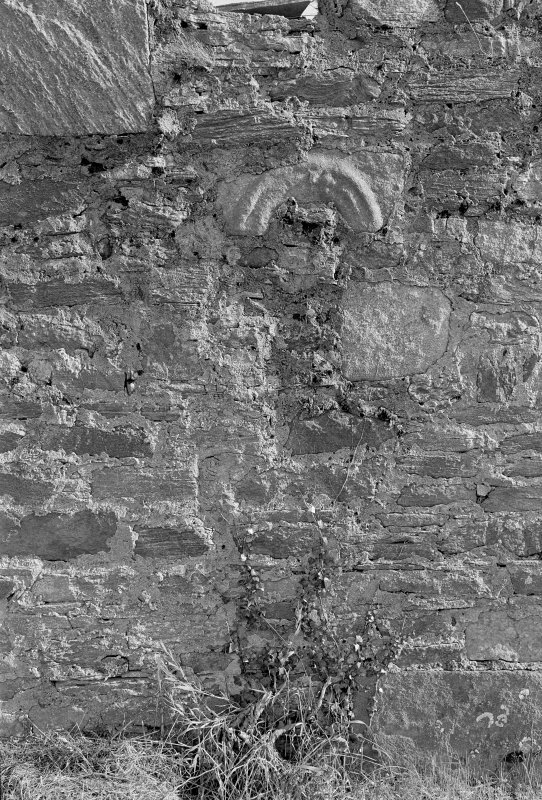 This section of the wall terminates in the east in a vertical series of quoin stones which evidently represents the NE angle of the original church. The masonry of the 16th century reconstruction is local rubble with dressings of yellow and red sandstone. 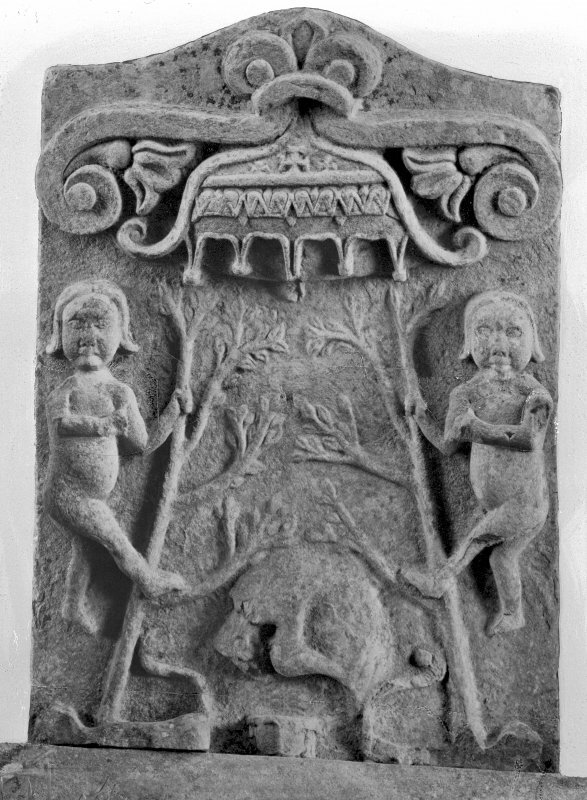 Towards the SW angle are remains of a square-headed doorway. A number of burial-enclosures have been constructed within the western portion of the interior at a comparatively recent date. 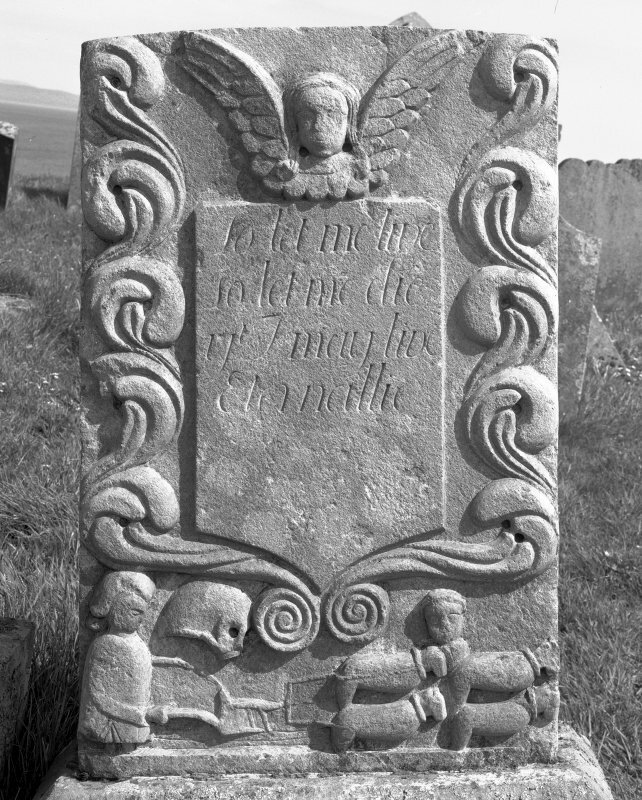 Part of the shaft of a late medieval cross from the burial ground is in Campbeltown Museum but only one identifiable tombstone in the church-yard dates from earlier than 1707. The church is as described and planned by RCAHMS (1971). 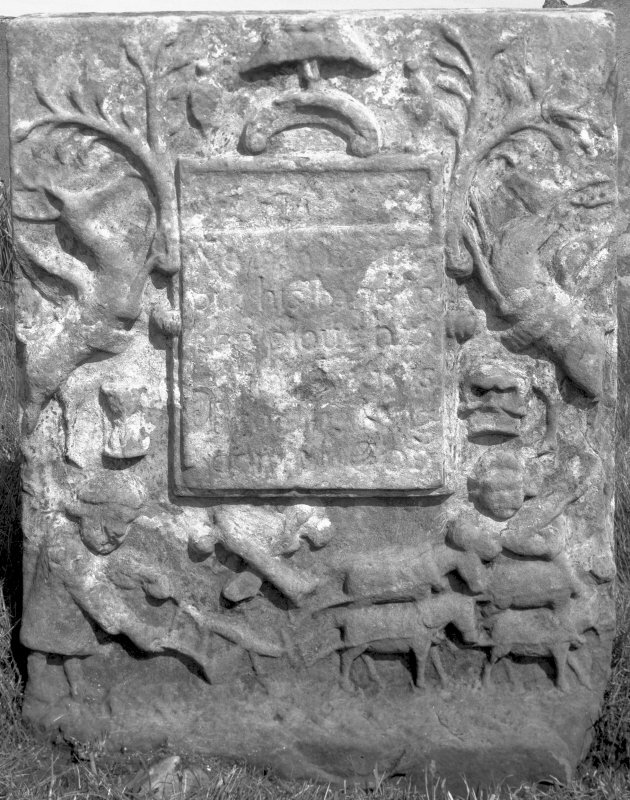 The earliest visible grave slab, dated 1692, is leaning against the W wall of the graveyard. The graveyard is still occasionally used for burials. Visited by OS (JB), 31 October 1977. 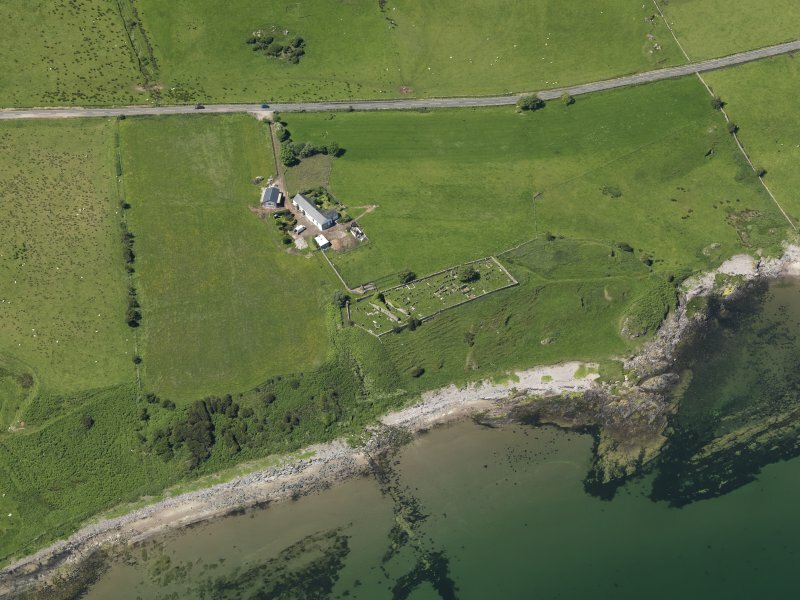 NR 7517 2204 Site identified as part of a coastal zone assessment survey. Mediaeval. Oblong. Random rubble; dilapidated at E. end. Gabled W. end. Roofless. Flat-headed slit windows. (d. 1807) and Donald (d. 1841) Smith, Ministers.